Chapel once again be a key venue at Festival of Chichester. Saturday, June 17, 1pm. Cellist Pavlos Carvalho returns to play Bach solo Cello Suites No 1 and No 5. Saturday, June 17, 7pm. Ensemble Reza. Ensemble Reza’s Jewels of Summer concert combines virtuoso playing with interesting programming. Monday, June 19, 1pm. What Guitar Trio. The ensemble – classical guitarists Michael Hughes, Jonathan Parkin and Ioannis Theodoridis – explores a wide range of original repertoire from the 18th century through to the 21st. Wednesday, June 21, 1pm. 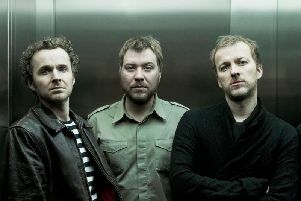 Sonamus Reed Trio. A witty programme for oboe, clarinet and bassoon, featuring some of the finest writing for wind instruments, from Mozart to Francaix. Thursday, June 22, 1pm. The Hanover Band – Beethoven’s World: 1800. Distinguished members of the Hanover Band join members of the young talented Consone Quartet to perform the Devienne Bassoon Quartet Op 73 No 3; Beethoven Septet Op 20 in Eb major. Thursday, June 22. 8pm. Gordon Giltrap with special guest Carrie Martin. Friday, June 23, 1pm. Lunchtime Harp Recital by Elizabeth-Jane Baldry. Harp solos from five centuries – from the refined Renaissance through the glittering Baroque, naughty Victorian fairies and ground-breaking contemporary music, performed by one of England’s finest harpists. Friday, June 23, 7.30pm. All That Malarkey. The critically-acclaimed vocal ensemble return with their brand-new programme for 2017, blending cabaret, comedy, classical music and “bonkers” behaviour. Saturday, June 24, 7.30pm. The Bonzo Dog Doo Dah Band Changed My Life Forever. Isosceles Theatre Company – Pat Abernethy and Dave Marsden - return with a gem of a play featuring two pop wannabees. Sunday, June 25, 1pm. Chorões! The Chorões, an ensemble from the Royal College of Music, present traditional Brazilian music drawing on both samba and classical music.